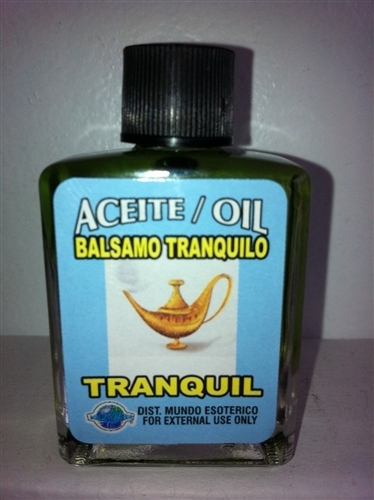 This is authentic mystical / spiritual dressing and/or anointing oil for TRANQUIL (BALSAMO TRANQUILO). 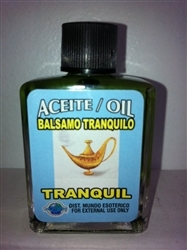 These oils are used in various spells and ceremonies and are 1/2 fl oz ea. They can be added to baths, oil lamps and can be used to dress candles. Many spiritualists use these oils to strengthen petitions and spells. They are printed in English and Spanish. Multiple titles are available under separate listings. They are also available in packages of 4, 10 and 20 (your choice of titles!) under separate listings with FREE SHIPPING in the U.S. and it's territories! If you don't see the one you need or have a question, please email us!